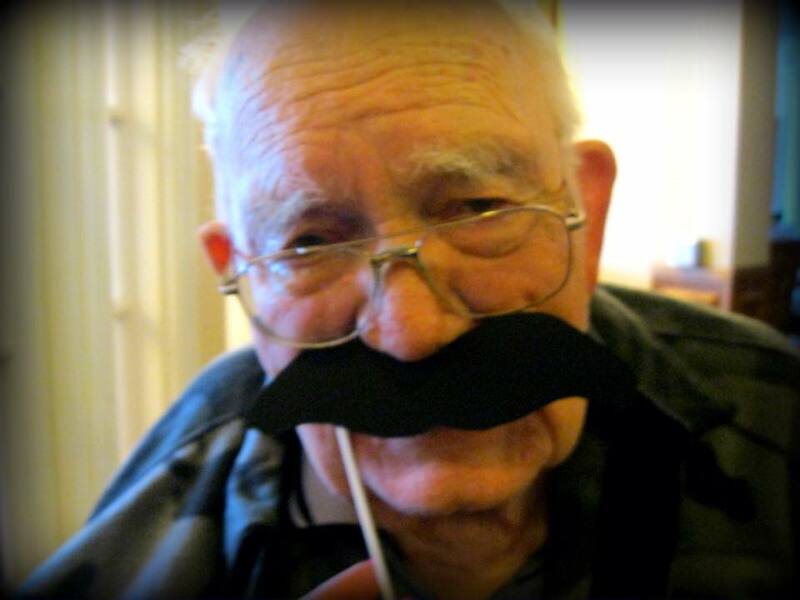 Lost and Found . . . .
My sweet dad on “Mustache Day”. . . three weeks ago. My mind ran in snippets yesterday as I remembered my dad as a much younger man. He was number five in a line of six children, grew up during the Depression on a farm in Pixley, California. He was loyal, dedicated to loving his family, and was never afraid of hard work. My first “real” memory of Dad goes back to when I was three years old, after he returned from the fight in Korea. I remember the strength of his arms when he picked me up and held me close. The following years are a blur of Dad working hard to care for our family–even as he struggled with the aftereffects of war. A memory I especially cherish, is of walking down the church aisle on his arm, to marry my husband of (now) forty-four years. Even sweeter were the decades that followed, when he embraced his role as, “Grandpa Clyde”. . . priceless! “‘Are you OK?’, I asked. I realized she was watching the car next to us. A man in his eighties, maybe nineties, was occupying the passenger seat. His eyes were sad and his head nervously moving back and forth. I was struck by how the lost elderly man reminded me of my dad in recent years. Age definitely took a toll on Dad as he fought to retain his independence. It was hard when he had to admit that he could no longer take care of Mom by himself. I wanted them to move closer to where I live. Dad rightly refused the offer, citing his desire to stay closer to his sisters and the rest of the family. The move proved to be a good one. Mom and Dad benefited from getting their medications on time, eating healthier food and enjoying visits from family. Even so, the bitter reality of dementia robbed him of the joy of being able to drive when he became hopelessly lost in what had been familiar places. When Mom died two years ago, Dad’s lostness increased. “I miss Mama,” were the words he most frequently uttered when anyone tried to talk to him. Even so, we noticed a sweet gentleness emerge, more in keeping with the farm boy he was when he gave his heart to Jesus at age thirteen. Time has slipped away all too fast for our family, but the words of the woman standing watch over the elderly man in the parking lot brought a comforting perspective, “I am just waiting for someone to return for him.” In a sense, that is exactly what has happened these past two years with Dad. We have enjoyed him as Dad has waited in hope for the return of His Savior. “Christ suffered for our sins once for all time. Feeling lost? Desiring to be found? There is no one greater than the Good Shepherd of our hearts, to lead us safely HOME. ‹ PreviousHearts + Chocolate = Love . . . REALLY? Next ›A Simple Faith: Connecting-the-Dots As God Intends . . . . Thank you Kris, I love you too. Thanks Beth. It is a wonderful comfort to think about Dad opening his eyes to see Jesus for the first time. That and knowing that he has been finally and forever healed of his infirmities delights my heart! Dearest Kathie, please know you and your family are in my prayers. I am so sorry. What a beautiful picture of your father… and what a beautiful picture of our Heavenly Father, who cares so deeply for us. Know you are loved! So sorry to hear about your loss, Kathie! But so glad that the Lord brought this post to your memory. He is so faithful to bring us comfort in these hard times. Blessings to you and your family. So sorry for your loss, Kathie. I can tell from your post that the Holy Spirit is comforting and guiding you through this difficult time. Yes Bill, the Lord continues to prove Himself faithful as the Shepherd of my heart. Praying for God’s peace to continue to be with you and your family. Your words touched my heart. Very sorry for your loss. Hopefully I will hold onto these sweet/God-filled thoughts when I’m in the same boat of losing a parent. Thank you, Karen. I know and trust that God will provide exactly what you need when the time comes, according to His Sovereign Goodness. What a Faithful God we serve! Dear, dear friend Kathie. I am praying for you that the Lord will fill you with love and comfort as you let your mind wonder through the years with your Dad. I’m always comforted by the first question of the Heidelberg Catechism that says, “What is your only comfort in life and in death? That I belong body and soul, in life and in death, not to myself but to my faithful Savior, Jesus Christ, who at the cost of his own blood has fully paid for all my sins and has completely freed me from the dominion of the devil; that he protects me so well that without the will of my Father in heaven not a hair can fall from my head; indeed, that everything must fit his purpose for my salvation. Therefore, by his Holy Spirit, he also assures me of eternal life, and makes me wholeheartedly willing and ready from now on to live for him.” Much, much love, my friend! Oh Liz, thank you! I am going to print out the question so that I can commit it to memory while I am away–so beautiful and soul-feeding!